Every single year it’s looking like phones are catching up to your beloved PCs and Laptops. Mobile apps and especially, mobile games, are starting to become more complex and require powerful hardware to work smoothly. But buying the latest gaming Android or Apple phone every year might be a tad too harsh on the bank account. So what if you don’t want to break the bank every now and again to get up to speed with the latest games and apps? If you need an Android platform but do not want to invest in a mobile device, we have one easy solution – BLUESTACKS. What started in 2011 as an emulator to play high-memory consuming mobile games using the dominant desktop, is now a fully-functioning app player. That’s right, all the apps and environments found in your lovely smartphone can now be easily accessed on your Windows or even Mac devices! Then it’s time for you to use BlueStacks! Now we have the all great emulator known as Bluestacks, so how do we download and install it? 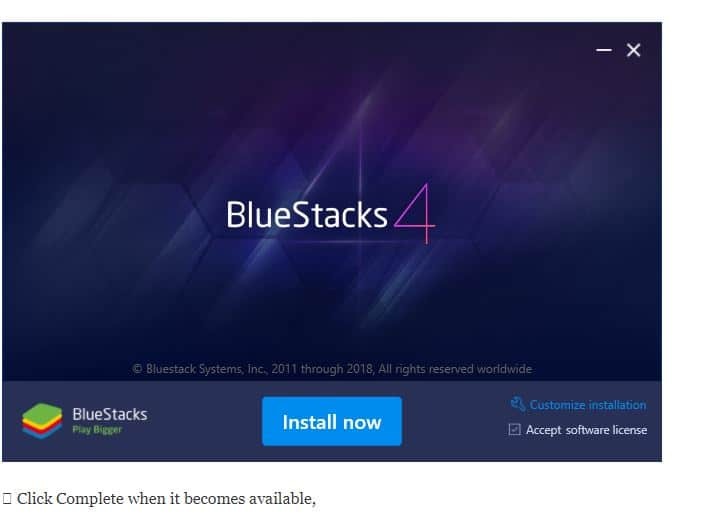 Step1: If you don’t already have Bluestacks installed on your computer, then simply go to the program’s website: https://www.bluestacks.com you’ll see a green DOWNLOAD BLUESTACKS for PC button in the middle of the page. Step2: It starts downloading BlueStacks in a few seconds. File Size is around four hundred and fifty MegaBytes, and it takes some time to get downloaded completely. Click it and depending on your PC’s operating system, and Internet speed.  Double-click the downloaded EXE file. Step 3: Follow the instructions and install BlueStacks Windows 10 or Windows 7 Laptop. Step 4: Open BlueStacks, if it doesn’t start automatically and follow the on-screen prompts to log into your Google account. you can search for any free Android app and install it on your PC for free. It is effortless to install any android app on your PC using BlueStacks Offline Installer for PC. Once you open the BlueStacks, it shows you both Top Apps and Other Apps which are by default supported by BlueStacks. You can click on them and install those free Android apps on your PC for free. Some cool Bluestack alternatives for MAC. Bluestacks is an excellent Android Emulator and all, but it does tend to require some hefty hardware requirements to experience stream-lined use and gaming truly. Some of you might not have the best computers out there, so we have 5 Bluestacks alternatives below that are more low-end computer friendly.